I had a round of brie cheese in my fridge that needed to be used up. 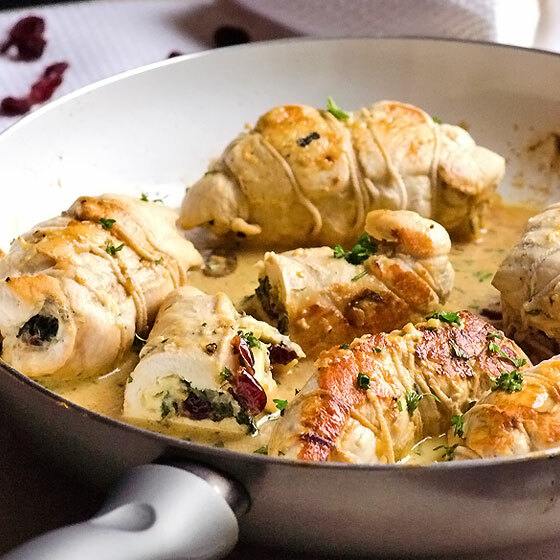 I found this chicken stuffed with brie, spinach and cranberries, and I am so glad I did - it's moist, flavorful, juicy, and wonderful! Cut chicken into 6 tenders. Slice each tender lengthwise in the middle but not through. Open flat and tenderize a bit. Set aside. Preheat large non-stick skillet on low-medium heat and swirl oil to coat. Add garlic and onion, saute until translucent, stirring occasionally. Add spinach, cranberries, thyme, salt and pepper; saute for another minute. Remove from heat. Preheat oven to 375 degrees F. Divide spinach mixture into 6 piles. In the middle of a flat open chicken tender, place a slice of brie and 1/6th spinach stuffing next to it. Fold in half, tuck in the ends (if possible) and wrap tightly with kitchen twine. Repeat with remaining chicken. Sprinkle with salt and pepper. Return skillet to medium heat and swirl remaining 1 tsp of oil. Add stuffed chicken and sear for about 3 minutes per side. If your skillet is oven proof cover it or transfer chicken to a baking dish (and cover), and bake for 25 minutes. Remove from the oven, let chicken stand 5 minutes and remove the twine. Serve hot with a side of choice (brown rice, quinoa, potatoes etc.) spooning juices on top.